I took a rider's safety course at my local college last summer. They supplied the bikes. I rode a 250 something or other. Just a small powered bike - perfect for negotiating the pylons, etc. I easily passed my test and now was hunting for the ideal bike to own. My husband took me to lots of cycle shops and I tried out all kinds of bikes. I was thrilled he wanted to buy me one, but which to choose? I am about 5'3" tall, and some sat too high and my feet didn't comfortably set on the ground (you'll need to - for stops!) Some I couldn't reach the shifter with my left foot; often the culprit was the wide gas tanks. Some bikes were too heavy to push backward into a parking space, and this is something to consider as well. It has fantastic storage capability (I brought home a pumpkin using under the seat storage last fall, and can do a ton of grocery shopping and put it under the seat as well!) There is a large expansive glove compartment below the instrument panel by the handle bars and a device to charge your cell phone while riding. Now the best part! It handles beautifully, and is a smooth ride. The instrument panel has digital readouts and gives you all the information you need when riding. It is automatic and for those people with carpal tunnel syndrome in your left hand, your fingers won't go numb as there is no clutching to do. It is sleek and sporty looking - almost space-agey! With this bike, you can practice your cornering and handling and how to drive defensively (looking out for cars and others on the road) while not worrying about switching gears. Some people say "It's not a REAL bike" 'cause it's automatic". I tell them that if they have a car without a shifter, "Well it's not a REAL car, cause it's automatic". LOL! Some people are what I call bike snobs. Unless it is a particular kind, they look down on you and don't offer for you to ride with them. This Burgman isn't a bad boy bike but as a female it is perfect for me as a newer rider. But you know what? Burgman's hold their value better than other bikes and are perfect for city commuters. Hey, maybe I need to start my own Burgman riders club! The price of gas will be going up this summer they say, so whether it be a bike or a scooter, this mode of transportation will be the best way to strike back at the oil companies! Hi! I wrote this article more than a year ago, and came across it again. I had totally forgotten about it and was heartened to see the positive comments made by people - especially the males! They came to my defense to say I should just ignore those people that look down on those of us that ride highway scooters. Thank you for this! Might I concur that indeed a 400cc CVT is just as dangerous to operate as a 400 cc "regular" manual motorcycle. I did notice a similarity with the bike snob group: They were all female and judging by their writing, could use a good lesson in proper grammar. So you girls might be able to shift your motorcycle gears but "y'all need a little more educayshun" between the ears!. LOL! I got the opportunity to see this bike up close and personal and seen the features on it. Let me tell you that this was introduced to me by a gentleman who owns Harley's and uses this bike during the week to commute to work. It has a "real" engine not a scooter little engine and it is legal for use on the freeways. Top speed this man has gone on this bike is 110 mph. He says it's very stable and even feels safer to ride this than the Harley at times. Don't get me wrong here...he LOVES his big bikes! I honestly think that for a beginning rider this would make a good commuter bike and prime anyone up to riding the bigger bikes. Safety, ease of control, and comfort can only lead to rider confidence and once you have that confidence than they can always take it to the next level of bikes. Confidence in your riding ability is key. Heck at least your riding!! I think the future will find more motorcycles that have automatic transmissions, or, at least automated manuals. The US government imposes restrictions on the amount of emissions any motorized vehicle can emit. Motorcycles are no exception. In order to meet these regulations there are certain areas that engineers can change. Transmissions are one. Transmissions is an area where emissions and fuel economy can be improved. In autos, the new trend is to have 6 to 8 speeds or more with "automated manuals". The driver can select manual or automatic. However the computer is still in control and does not allow conditions that result in high emissions or foolish choices by the driver. The result is improved fuel economy. The computer actually memorizes the drivers driving style. I see this technology being applied to motorcycles. We will see more automatics, and automated manuals in motorcycles in the future. I'm appalled by the comments made by "bike snobs." I ride a motorcycle, but don't feel the need to look down on or criticize those who choose to ride scooters. Why feel the need to judge those who are not riding a "big girl's bike?" It gives motorcyclists a bad name. You know those guys/gals who rev their engines really loudly at the red light to garner attention that nobody gives them because we all know they're overcompensating for some kind of deficiency? Well, please don't be one of those people with your unkind remarks. Ride your motorcycle and try not to look down on scooter riders because when you're so busy looking down on others, you might end up hitting something. Pay attention to the road. It is a scooter and the riding endorsement in my state is a lot different than the motorcycle endorsement. So you cannot ride a motorcycle but a scooter. However, they are fun and whatever you feel comfortable and have a good time on. Heck I ride a motorcycle with a side car but that is another endorsement. They handle different on the curves and you can ride off rode. As long as you are out there on the mean street and love what you ride. I think I am a snob too. Sorry but this is not a motorcycle. I had a friend in my motorcycle learner's group and she was riding a scooter to work but wanted to learn how to ride a motorcycle. She was getting mixed up because there isn't a clutch on her scooter and the brake was on the other side. If you want to ride, ride. But I'm not waving at you. MO was my favorite "gal" student! OK, she was my only female in my male dominated course. You were the best student, and you were also the most improved student!! You should be proud, I wish all the female students were like you! Ready to learn, challenging yourself, first one there, and last to leave. No one was going to intimidate you.. You were awesome!! I loved it. PS.. that mean bike that you were learning on was a 125CC.. but sssshhhhh don't tell anyone .... Let them all believe it was a 600CC OMG mean machine. I guess I would be counted as one of the bike snobs, because that is a scooter not a motorcycle. 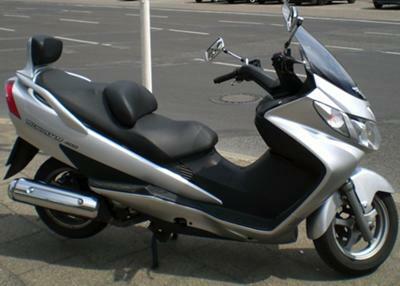 If it what you choose to ride it is certainly your business, but it is a scooter, not because it is an automatic, but because it is a scooter, lol. Not the same thing no matter how much you want it to be.